The Ruffwear Track Jacket is a high-visibility, reflective jacket that protects your dog in low-light conditions. Built with durable, waterproof polyester fabric, the jacket has a lightweight, streamlined design that’s quick and easy to put on using side-release buckles. 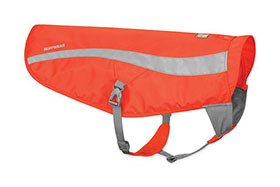 Reflective panels along sides and in the chest enhance visibility on all sides. 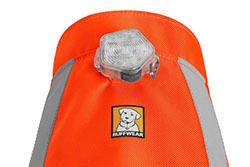 For added safety add the Ruffwear's safety night light, the Beacon.